At the behest of Kalyanamalai, Vivaha Prarthana, a mass prayer for the early marriage for all was arranged on 8th March in Kalyanamalai MNC Vel Kalyanamandapam, Sulr, Coimbatore and on 15th March at Jai gopal Garodia School, in Tambaram Sanatorium, Chennai. In the pooja program conducted by qualified Vedic scholars chanted the 1008 names of goddess Parvathi and Lalithambigai one crore times for the benefit of all. Everyone of us has a prayer. May be for the early marriage of our son or daughter, their well being after the marriage, good health and a comfortable life. While offering an individual prayer helps us with peace of mind other benefits, a mass prayer with the participation of good number people brings more benefits. It may not be possible for individuals to arrange such mass prayers at home. That is why Kalyanamalai with the good intention of bringing benefits everyone, arranges such prayers very often. 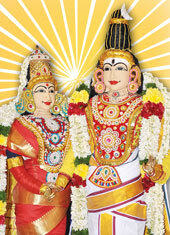 Kalyanamalai invites the alliance seekers, people waiting to arrange marriage and all those who have belief in god to join our Mass Prayer and Koti Archana celebrations when ever and wherever held for the best benefits. Let us pray to the almighty for the benefit of all of us.